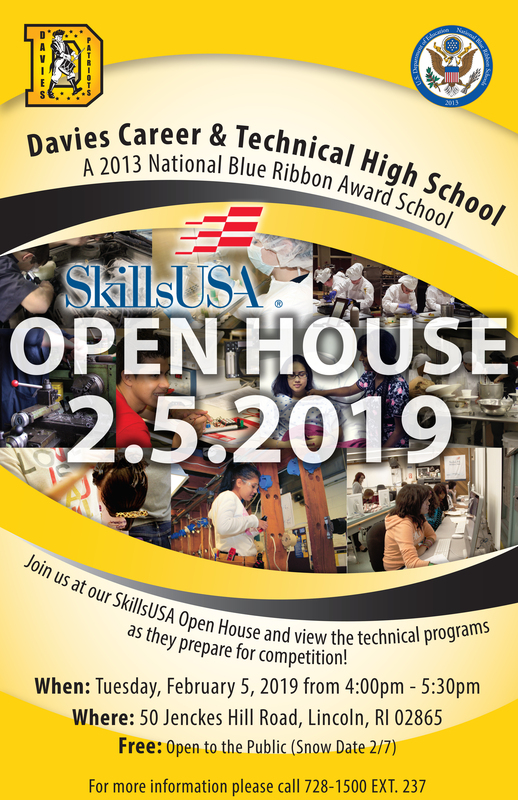 Davies would like to invite Davies’ students and their parents, local Middle School students and their parents, business partners, and the community at large to learn more about SkillsUSA competition during Davies’ SkillsUSA Open House on February 5th from 4-5:30pm in Davies’ Atrium. Davies’ SkillsUSA competitors will be on hand to demonstrate their skills and knowledge on their area of study in an effort to foster awareness of SkillsUSA. Every student at Davies is a SkillsUSA member. SkillsUSA is a national membership association serving high school, college and middle school students who are preparing for careers in trade, technical and skilled service occupations, including health occupations, and for further education. SkillsUSA is a partnership of students, teachers and industry working together to ensure America has a skilled workforce. SkillsUSA helps each student excel. Refreshments will be served. This is a fun free family friendly event open to the public.